Hiking through the Bruce Peninsula, I was happy to get up close and personal with Mother Nature. Winding my way through trails in different areas, I was happy to see different trees and flowers and especially the unique views of Georgian Bay. For every hike I did, the topic of wild animals would come up – bears, coyotes, wolves, snakes – this is their habitat too, but alas I saw none of them. My good friend dropped me off one night, and minutes later she saw a bear, slowly walking down the road – but me, no sightings. Until we drove in the afternoon to Cabothead, to check out the lighthouse and walk around the area – and I got to see a chipmunk. I usually get to see chipmunks, since the wee animal is still happily surviving in many big cities, including the one I live in. But to see this wee chipmunk, at the side of a road, not afraid of a vehicle, was a surprise. It was as if the chipmunk wanted to see as much about us, as we did about him. 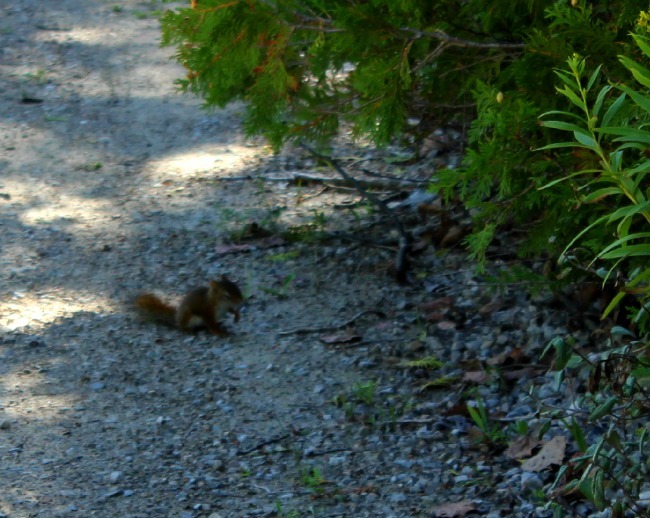 So there was my encounter with Canada’s wildlife, a couple of minutes watching a chipmunk on the side of a gravel road, observing us like he was watching a program on people.